← 111 "Gobble, Gobble, Toil and Trouble"
"Get all the fun of Black Friday without any of the misery of getting off the couch! Check out our hourly, weekend-long, promotions starting Friday! Splurge on man's best friend! Get a deal on Santa's Little Helper tomorrow at 12 AM PST or 12 PM PST! He knows all the tricks – sit, stay, and tap!" The Simpsons: Tapped Out Black Friday 2015 content update was released November 26, 2015 and is the one hundred and twelfth content update, adding 1 new building. It was teased by EA on their Facebook Page November 25 and 26, 2015. Its the game's second Black Friday update, after Black Friday 2014. Kwik-E-Mart Central Office 145 6s Marking Up Global Prices Provides no points to Conform-O-Meter. to December 2nd at 8am GMT. The Black Friday deals launches on November 27, 2015 at 8am GMT. 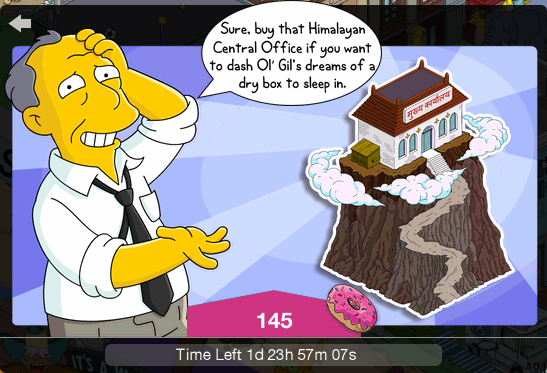 There was an offer to buy the Kwik-E-Mart Central Office on Cyber Monday, November 30, 2015. 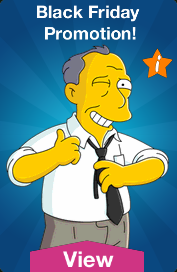 Gil, upon entering your town and if there is a new rebate offer, spawned and said: "Check out our newest rebate offer! ", at which point he appeared with the over his head, which upon tapping lead to the Black Friday menu, and he disappeared (In Krustyland, this lead to the "Characters" menu). On Cyber Monday, Gil appeared with over his head. If you buy a character that requires a higher level then yours, a system message will appear saying "'character' comes with a premium quest line which will unlock at level 'level'!". The character is playable but you won't unlock his questline till you reach the level. Black Friday 2015 One Panel. Cyber Monday 2015 One Panel. Kwik-E-Mart Central Office One Panel. Robby The Automaton This Little Wiggy, Lisa the Skeptic, Treehouse of Horror VIII - "Fly Vs. Fly"
Powell Mansion Oh Brother, Where Art Thou? The Happy Sumo One Fish, Two Fish, Blowfish, Blue Fish, Black Widower, In Marge We Trust, Guess Who's Coming to Criticize Dinner? Teleporter Alpha and Teleporter Omega Treehouse of Horror VIII - "Fly Vs. Fly"
Yesterday we gave thanks for our many blessings. Today we give thanks for fantastic bargains! It's Black Friday! Get in the car, everyone. I don't want to miss a minute of fighting other women for the last discount purse. Oh, I hate that! Some lady always elbows me in the belly. I feel sorry for the lady who just got her elbow stuck in lard quicksand. Well, if you hate leaving the house on Black Friday, shop online at Ol' Gil's cyber store! I've spent all my pharmaceutical trial money collecting a Black Friday grab bag of goodies, and I'm ready to sell them to you. You shop, I ship. And the cherry on top? 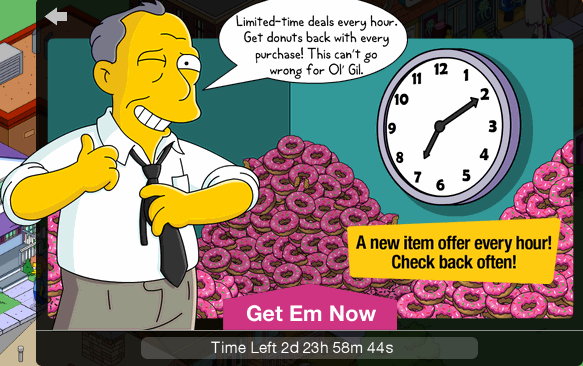 Ol' Gil will give you back donuts for every purchase you make! Gil's cyber store will never succeed. People love going to a real store with a friendly clerk. Hey old man, this is a store, not a retirement home. Buy something or get out! Mr. Gunderson, if you think your cyber store can outsell my Kwik-E-Mart, you are sadly mistaken. Well, I'm feeling pretty good. Care to bet some money on who sells more? I am not a gambling man. Actually, my chief source of income is selling lottery scratchers, so perhaps I am. You have a bet! ...or child playing on their parent's phone. Boy, it's Cyber Monday, and I've got a whole heap of tech doodads for sale at my cyber store. Apu doesn't have a chance of winning our bet about who sells more. You are wrong! The Kwik-E-Mart Central Office is announcing unbeatable deals. Everything is on sale at our brick and mortar stores, including the bricks and mortar. In fact, even the Central Office is on sale. Lovely building, Himalayan location, sherpa parking. If Apu sells that Central Office I'll lose our bet for sure. And I already made a down payment on a cardboard box to sleep in. I've got to stop it. 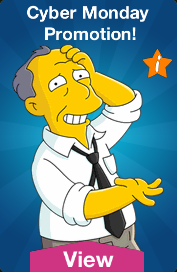 Luckily, no one is better at blowing a sale than Ol' Gil. You didn't buy the mountain thing! I won my bet with Apu! I'm gonna buy some ten-dollar shoes and take Sally from Accounting out for a slice of banana cream pie! You got lucky this time, Gil. And as every good gambler knows, you've got to keep pushing your luck until it collapses in disaster! Aw, you bought the Central Office. That means I lose my bet with Apu. So long, money. So much for me taking Cindy from Shipping out for cheeseburgers and malted milks. I wonder if that Central Office is hiring? The Happy Sumo w/Akira Akira comes with a premium quest line which will unlock at level 27! Unfinished Shed w/Chester Dupree Chester Dupree comes with a premium quest line which will unlock at level 24! Rocket Car w/Lampwick Chester Lampwick comes with a premium quest line which will unlock at level 15! Stu's Disco w/Disco Stu Disco Stu comes with a premium quest line which will unlock at level 15! Rancho Relaxo w/Don Vittorio Don Vittorio comes with a premium quest line which will unlock at level 17! French Waiter French Waiter comes with a premium quest line which will unlock at level 19! Cracker Factory w/Luann Luann comes with a premium quest line which will unlock at level 8! Lugash's Gym w/Lugash Lugash comes with a premium quest line which will unlock at level 29! Sherri and Terri Sherri and Terri come with a premium quest line which will unlock at level 12! Apu! It's time you showed some ambition in your career. I want you to apply for a promotion to management in the Kwik-E-Mart Central Office. But dearest wife, think of the commute. It's a seven-hour mountain trek each way! I'll never have time to see you or the children. Okay, putting it that way, I'll definitely apply. Notes: Ned has a new premium 8h job at the Kwik-E-Mart Central Office: Go Mountaineering. Hank Scorpio has a new premium 8h job at the Kwik-E-Mart Central Office: Scout a New Mountain Lair. Apu has a new premium 12h job at the Kwik-E-Mart Central Office: Work At The Central Office. My dream has come true! I have been promoted to management in the Central Office! You betcha. They had just the job for me, based on my previous work experience. I thought the Kwik-E-Mart corporation hated handling complaints. They do. Why do you think we're on top of a mountain? Note: Manjula can be sent too. Don't you just love working up here on top of a mountain, Apu? The fresh air, the great view, the thrill of stumbling across some mountain climber's frozen corpse. I suppose. But winter is coming. What if we get snowed in? It'll be great! We'll have hot chocolate, play cribbage, and talk, talk, talk about our many problems and failures. I'm going back to my old store right now! 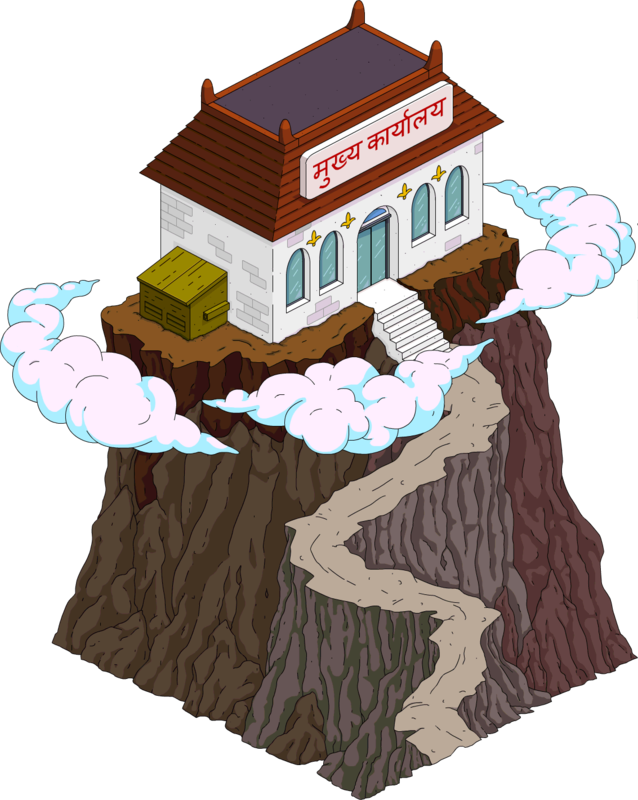 The Springfield Observatory, Lugash's Gym, Police Car, Kodos Topiary, Crashed Police Car, Stu's Disco, Rocket Car, Boardwalk Fountain and Film Set now requires Level 1 to be stored into inventory. Dr. Nick, Santa's Little Helper, Blue Funzo, Pink Funzo, Purple Funzo and French Waiter now requires Level 1 to be stored into inventory. Sherri, Terri and Bart's Torment Bart now yields 1,114 and 280 instead of 1,680 and 420. French Waiter's Clean His Tuxedo can now be done at Brown House too. Apu's Set Up The Halloween Display is now temporary. Mr. Burns' Read From the Necronomicon now requires A Little Light Reading to be complete. Coach Krupt's Coach at the YMCA doesn't require Kruption Pt. 5 to be started anymore. The glitch that made income over buildings disappear once Gil shows up with a new hourly offer was fixed for the duration of Black Friday. It wasn't fixed on Cyber Monday sales on November 30th. Modified on June 3, 2018, at 13:39.